Bringing nutrient balance and potency to the optimum level has an outsized influence on whether a garden and its harvest is a success or failure. An incorrect nutrient concentration can lead to deficiencies; but far more often the result is over fertilization and nutrient toxicity. That is why it is imperative that gardeners carefully and frequently monitor the nutrient concentration of their mix. This is done by means of metering gauges which measure electrical conductivity. EC – Electrical Conductivity: All nutrient ions found in water carry an electrical charge. This is how nutrient meters measure and estimate the PPM. EC is charted with a decimal point, with most EC meters using a measuring scale from 0.2 to 3.6 EC. PPM – Parts Per Million: For every million parts of water, the PPM tells you how many parts of non-water molecules are suspended in the water. Pure water does not conduct electricity; but rather, it’s the dissolved salts and metals in the water which are conductive. TDS – Total Dissolved Solids: This refers to the impurities in the water. Whatever compounds are dissolved in water are considered a dissolved solid. The non-water compounds are anything water has dissolved, including nutrients. CF – Conductivity Factor: CF measurements are EC figures without a decimal point. CF is a European standard whereas EC is primarily an American measurement standard. Although even the inexperienced gardener might be somewhat familiar with EC and may use a nutrient tester to monitor nutrient levels, the sad fact is that the majority of gardeners don’t fully understand, nor appreciate, how the levels of elemental salts and metals can affect plant growth, and also the extent to which caution needs to be shown so as to avoid an overly concentrated nutrient mix and the harm this wreaks on plants. Thus, an in-depth knowledge of why EC is so important allows the informed gardener to take the guesswork out of correct plant feeding. Gardeners who are unwilling to do the research and acquire this chemical understanding do so at their own peril; because for a fact, it’s this specific lack of EC knowledge which is responsible for the number one problem among novice gardeners and many ruined gardens. While using slightly different methods to convert EC to PPM, most quality meters use the same principle to obtain the reading. A low-charge electrical current is sent from one electrode to another, and thus the strength of the electrical current traveling through the solution is measured. This allows the gardener to know with reasonable accuracy the ratio of ionic salts – the main ingredient in nutrient solutions – to the water which the nutrient salts are mixed in. Pure water or distilled water has no electrical conductivity, but as salts and minerals/metals are added, electrical conductivity increases proportionately. For the most part, factors that can affect the concentration of the nutrient levels can easily be controlled once they are understood. One such factor is the evaporation of water out of the nutrient solution. When room temperatures are high, the evaporation rate is sure to accelerate. This will likely cause the solution to become over-concentrated. This happens in both hydroponic reservoirs as well as in pots where plants are being fed in soil or soilless mixes. When potted plants are located in a room that is excessively warm the danger exists that the nutrient levels in the growing medium will spike because of water evaporation. Evaporation not only increases the concentration of the solution, but it will also cause nutrient to be left behind and create a salt residue build up. If nutrient salt levels become too concentrated, a plant’s internal osmotic system will reverse in an attempt to expel the excessive salts and plants will actually become more dehydrated. As a general rule, fast growing plants need to be fed anywhere from 500 PPM during the early vegetative growth stage to 1,700 PPM of nutrient during the late blooming period. However, most expert growers do not exceed about 1,500 PPM. Since frequent reservoir change along with daily dilution of the nutrient solution is a highly recommended practice for hydroponic gardens, this makes EC/PPM testers a must for serious hydroponics growers. Consider that fast-growing fruit and flowering plants in rooms of moderate temperature can significantly deplete the levels of nutrient in the solution practically overnight. Therefore, testing the EC levels of the reservoir every day or two puts the gardener in a position of greater control and gives him the ability to keep the nutrient concentration at optimal levels for growth and flowering. The one limitation of EC and PPM meters is that they cannot tell the gardener exactly which elemental salts or metals are low or which are too high. In fact, there are some ingredients that will not register on nutrient testers at all because they do not conduct electricity. Urea, which is 46% nitrogen, and many chelates are examples of such ingredients. There are a number of things that can be done to limit the possibility of your nutrient solution becoming imbalanced, too weak or overly concentrated. The foremost method of ensuring that your reservoir contains the proper amount of nutrient is to test the EC often and to change the solution in the reservoir completely every five to seven days. 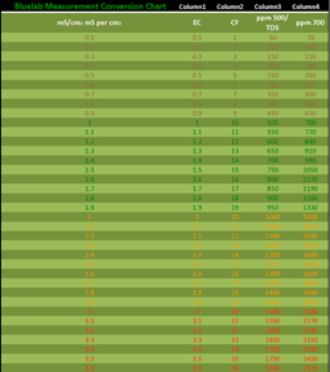 Always keep in mind that the PPM rating is an aggregate measurement of how much nutrient content is in the water, but not specifically the percentage of each type of nutrient that is in the mix. Consider then, that as plants are drawing nutrients from the solution, they will be absorbing and utilizing the respective nutrient types at varying rates in order to satisfy the needs of myriad plant functions; so the nutrients left behind are the ones needed in less quantity by the plants. Thus, it’s very common to have the recommended PPM but still be starving your plants of the foremost nutrients while at the same time having an oversupply of secondary and tertiary ones. And unless the gardener happens to have an onsite chemical laboratory, it’s impossible to know for certain the amount remaining of each type of elemental salt and mineral; so completely changing the feeding mixture every 5 – 7 days is essential. Never forget, just raising the PPM day after day to make up for nutrient drawdown will simply not correct the inevitable nutrient imbalance and likely do more harm than good. Because having too much of any one nutrient in the mix has the potential to create toxicity, putting a garden at risk of nutrient burn. Below is a photographic example of the adverse effects of even minor over-fertilization. 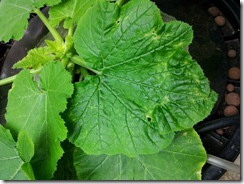 The photo on the left is a squash plant showing early signs of toxicity. Notice the deformity in the leaves. After replacing the water with a fresh solution, a short time later the same plant in the right photo now shows healthy new growth. If the toxicity were allowed to continue the leaf tips would’ve begun to yellow, resulting in permanent nutrient burn damage. Noteworthy is the fact that the healthier plants are, the more productive they become, and in turn, the greater their need for proper nutrition, and therefore the more important it is to change the solution regularly. In addition, as the nutrient mix is drawn up by plants and water lost through plant respiration, most expert gardeners recommend that the lost reservoir volume be replaced by adding filtered water to the nutrient reservoir so as to maintain a consistent water level during the days subsequent to the reservoir change. This is done to ensure that plants will remain fully hydrated. Moreover, the typical stress or shock experienced by plants from the initial potent nutrient mix dissipates as the plants are given time to metabolize these nutrients and take in the diluted, slightly lower PPM mix. 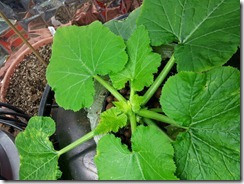 As for plants potted in soil or soilless mixes, an easy way to maintain the proper EC is to water the plant enough so that 1/3 of the solution drains out the bottom. This will ensure that any salts or metals left behind from the previous waterings are washed away. Even if you are using a premium nutrient, it’s not a bad idea to water your potted plants with straight pH-balanced water every third watering. Another key support in maintaining a properly balanced nutrient mix is gained by the use of only premium plant nutrients specifically engineered for hydroponic and indoor gardens. Premium nutrients are designed to minimize nutrient salt buildup. This is best accomplished by specialized multi-part plant nutrient growth solutions. Any nutrient product claiming to be an all-inclusive one-part growth solution will by necessity contain at least one anti-binding agent. These chemicals are used to keep the ingredients of the nutrient from binding with one another while in concentrated form. The problem is, plants cannot metabolize, and therefore reject these anti-binding agents. These rejected and unusable chemical compounds then begin accumulating in the grow media creating an unhealthy TDS imbalance. This condition often manifests itself as a crusty buildup which appears on top of the soil, soilless mixes or Rockwool cubes. Three-part base nutrients or those which are separated into “A” and “B” parts generally do not contain these anti-binding agents and hence offer superior growth and bloom performance. If at any time during the course of a growth and bloom cycle you suspect that an unhealthy spike in your nutrient PPM level has occurred, you should empty the reservoir of nutrient solution immediately and replace it with a clearing/flushing solution. Clearing solution can also be applied to potted plants if you suspect nutrient toxicity. Clearing solutions function by latching on to the excess salts contained in the plants vascular system and cells, as well as in the growing medium and then by means of reverse chelation leech the salts out and back into the reservoir. It’s a common practice for gardeners to use clearing solutions only at the end of the fruiting or flowering cycle in order to purge the salts with the goal of improving the taste of the final product. But by always having a flushing solution on hand, one could save a crop from nutrient toxicity when it seems to be doomed. The amount of nutrient in the solution that is fed to a plant is as important as the quality of the nutrient. Too much of one or too little of another can mean the end for your garden and all the hard work you’ve devoted to it. But by applying the guidance in this article along with general attentiveness to the needs of your garden, the probability of a successful harvest will greatly increase.